As you'd expect from a country with such a varied geography and richly-layered history, Colombia's food offers a fantastic mix of different traditions and flavours. From the coconut and spice-flavoured seafood dishes of the Caribbean coast to the cattle, corn and potato cuisine of the highlands, you'll find something to tickle your tastebuds, and hopefully also find the time to try some of the more... interesting parts of Colombian cuisine: deep-fried termites, anyone? 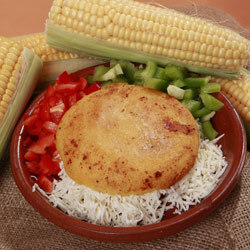 The classic Colombian accompaniment to any meal, or even the basis for a meal itself, is the humble arepa. Every region has its own take on this small corn pancake, but you will find them absolutely everywhere. Colombians get almost emotional discussing arepas so when you try them and find yourself, shall we say, underwhelmed... try not to let it show! Another common starter, snack or side dish is some variety of plantain. Patacones are deep-fried green plantains, often served with a spicy aji dip, but another great take on them is as aborrajado, where they are fried and stuffed with cheese... The local white cheese is also used to make the delicious fried cheese balls known as buñuelos and the traditional baked cheese rolls called Pan de Yuca, which are made with yucca flour and often eaten with breakfast. One thing which takes many visitors by surprise is that in Bogota, the traditional breakfast is pan de yuca, hot chocolate and... cheese! You're meant to break chunks off your cheese and melt it in the chocolate but if we're being totally honest we rarely feel THAT Colombian! Soups are regularly eaten as starters in Colombia, and a couple of the real standout dishes of Colombian cuisine fall into this category: Sancocho de Gallina is a speciality of Cali in the south-west, and is made with chicken and root vegetables. It can also be served with rice as a main meal - you get a spoonful of rice and dip it into the soup before eating it. Meanwhile, in the mountains around Bogota, the chicken, potato and corn soup called Ajiaco is absolutely delicious, although despite the name it doesn't have any aji in it at all. No discussion of Colombian food would be complete without mentioning the classic Bandeja Paisa. This belly-busting plateful of steak, eggs, beans, pork crackling, sausage and plantain originates from Medellin but is now found all over the country. It's surprisingly good but trust us: it makes a full English look a bit feminine. Although not quite as religious about their meat as the Brazilians or Argentinians, Colombian food does tend to have some nicely-grilled beef as its centrepiece but they wouldn't be Colombian without coming up with the odd crazy idea, and if you see Lomo al trapo on the menu then give it a go: it's a piece of beef tenderloin which is crusted in salt, wrapped in a teatowel and then baked in hot coals. 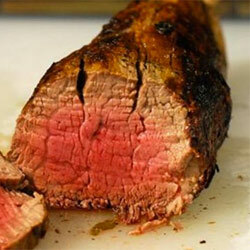 The resulting roast is exqusitely tender and full-flavoured. On the coasts, you'll find fantastic fresh fish dishes, usually served with aromatic coconut rice and often in creamy, spicy sauces. A speciality of Cartagena is the delicious Posta Negra, where thin beef steaks are marinaded in cinnamon, garlic, lemon juice and red wine before being slow-cooked. Fabulous! If you're a vegetarian and worried about the food in Colombia then the good news is that although some of the local specialities won't work for you, the sheer quality of the ingredients here means that eating out in Colombia will still be a very enjoyable experience. Tamales, various Arepas and Empanadas and their fillings, and a huge array of salads and fruits are all delicious and tasty, and the widespread use of cheese in traditional dishes means that vegetarians in Colombia don't miss out on any of the local flavour. It has to be said that being vegan in Colombia is a little more difficult, but it's nothing we can't handle either. Colombians get to enjoy some of the best fruit juices (jugos) in the world, thanks to a huge variety of fruits, many of which don't even have names in English. If in doubt, just give it a go and try and remember the names of ones you particularly liked! If you're looking for something a little stronger, then the local Caribbean rum is superb and absurdly cheap (Ron Medellin is our favourite but they're all good!) and it's usually drunk with Coke as a Cuba Libre but you can also have it with just a squeeze of lime. Meanwhile, the leading local beers, Aguila and Club Colombia, are nothing particularly to write home about but are fine and - again - have the advantage of being good and cheap: about £1 a bottle in an average bar.